Passionate young kiwi Jordyn Gregory is smashing her goals while forming a community of support for new mum and dads. At just 25 she has created Kiwi Birth Tales, a podcast created for kiwis to share their pregnancy and birth journeys. I chatted with Jordyn about her life, passion, journey creating Kiwi Birth Tales and the latest episode of her podcast. Words by Zeta, YWCA Hamilton. First could you tell us a little about yourself? I grew up in Tauranga and studied a Bachelor of Management Studies through Waikato Uni. When I was 22 I moved to Brisbane for a Graduate HR role. After that year they promoted me to a role in Sydney so I made the move there. I then progressed into a Human Resources Business Partnering role supporting 500 team members across a support functions team Australia wide. I love my job and have always been so career driven, but mid last year my Partner Joe was offered a contract in Italy playing water polo, so we decided to leave Sydney and move here for the season. I had never been to Europe before. We are living in Recco, Italy, a small town of 10,000 people by the beautiful sea. I am freelancing on different HR projects as well as contracting for my previous role. My work have been so supportive of me doing this which is incredible! I plan to go back there after the season and we see ourselves back in Tauranga in the future. What is Kiwi Birth Tales? Kiwi Birth Tales is a platform for kiwi mums and dads to share their pregnancy and birth journeys, to support and empower one another. I have a website and Instagram to support the podcast which is coming up 20,000 listens in just a few short months. How did you come up for the idea? I have always been curious about pregnancy and birth, I had considered studying to be a midwife when I left school but decided I wanted some more life experience first. I loved listening to other birth story podcasts and YouTube videos and when my friends started having babies I realised there was nothing similar in New Zealand and a real lack of resources online. I want kiwi mums and dads to feel empowered in making decisions about their pregnancies and births. I want to create a community where families can share and learn with one another and never feel isolated or alone. It is important to me that we normalise birth and talking about the reality of birth in New Zealand. Where do you want to see Kiwi Birth Tales in 5 years? I want to see Kiwi Birth Tales continue to grow and gain awareness through sharing unique experiences of NZ pregnancy and birth. It is my goal to create a platform that becomes an extremely valuable resources to families when they are preparing for pregnancy and birth. In five years I hope the platform is a go-to recommendation from friends and family to all pregnant women and families. What is your most favourite and least favourite part of your role? My favourite part about being the host of KBT is hearing each story, enjoying the differences and feeling so privileged that these families are willing to share their experiences with me. My least favourite part is having too many emails in my inbox and not enough time to interview everyone all at once. I am currently booked until the end of April and have so many women waiting to share their stories - I wish I had the means to put my time into it on a full-time basis. What is the best piece of advice you could give to women out there? Your experience is never isolated and if you are feeling lost, reach out to a community, search for an online platform or resource you can use to connect. What do you think we need to do as women to support each other more? I could go on for days with the answer! To put it simply I think we need to care about each other like we would our own loved ones. A kind message or comment can change how someone feels about their day or their week, just like a negative one can. I think we should be building one another up and sharing our experiences as much as possible, strong women support other women. Please tell us a little about your latest podcast: Caitlin, Kyrie & Kemba. Caitlin’s episode is so beautiful, she is an incredible woman and I am so grateful she took the time to talk with me. Caitlin discusses the birth of her first daughter Kyrie, and then falling pregnant and losing her baby boy at 38 weeks. Caitlin talks about finding support in her partner and family and wanted to share her experience to help others who may have been through or are going through something similar. I am in awe of Caitlin and think she is such a brave and compassionate kiwi mum. To listen to the Kiwi Birth Tales latest podcast on local mum Caitlin, head over to @kiwibirthtales on Instagram (link in bio), or the website. TW: Caitlin, Kyrie & Kemba covers birth, loss, grief and support mechanisms. If these are triggers for you please take precautions when listening in or avoid. If you are interested in getting involved with Kiwi Birth Stories please message Jordyn on her Instagram or email kiwibirthtales@gmail.com top submit your story. Since Outward Bound I have been embarking on the journey that you call life. Although it’s been difficult nothing to me has even been as hard and challenging as Outward Bound. Applying for the scholarship to attend Outward Bound was a leap of faith and I knew I wasn’t loosing anything by applying. Since that time the YWCA has played a key part in my development and to where I am today. 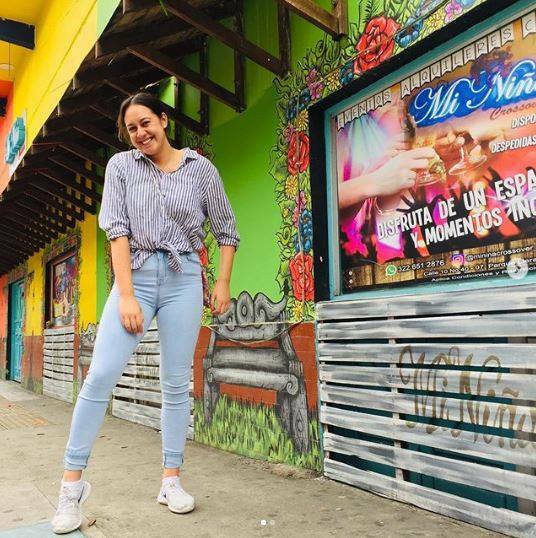 I am currently in Colombia, Medellin a part of an internship here in a company called COMFAMA, a non profit organisation that caters to the needs of the people here. I am here for 3 months and am working in the travel department as part of my degree studying tourism and Spanish and I get to travel to amazing parks here and create a purposeful beneficial journey for people around the city. I love my job here and I know that I wouldn’t be where I am today without ywca. Last year I was having a gap year and learning more about the real world. The YWCA has supported me in many ways, supplying me with work and allowing me to be involved with holiday and after school care programs. One day I was working at the University campaigning for the YWCA where being involved with many conversations I was encouraged to enroll in university. The YWCA was super supportive of me and even encouraged me while I was working there to go and enroll! Although it was last minute 3 days later I was attending university. Through this time there were many opportunities and applying for a scholarship to attend this internship seemed like a dream. But I took a leap of faith and applied. I thought well it’s ok if I don’t get it, I’m not losing anything. Finding out i got accepted was a very emotional heart felt moment where I knew I would face a new challenge and be fully immersed in a different culture facing many trials but growing in independence and confident to learn more about the world and learn more about myself. Grabbing opportunities as they come is very important and contributes to a person’s success! From my experience and personal development I am extremely grateful for the role the YWCA has played in who I am today and it’s because of them and making the most of opportunities as they come that I am where I am today. Sometimes opportunities don’t present themselves easily that’s when it takes time and effort to search for them and make your own! You can read Jahvaya’s original Outward Bound blog post here. To find out more about our Outward Bound scholarships head to www.ywca.org.nz/outwardbound. 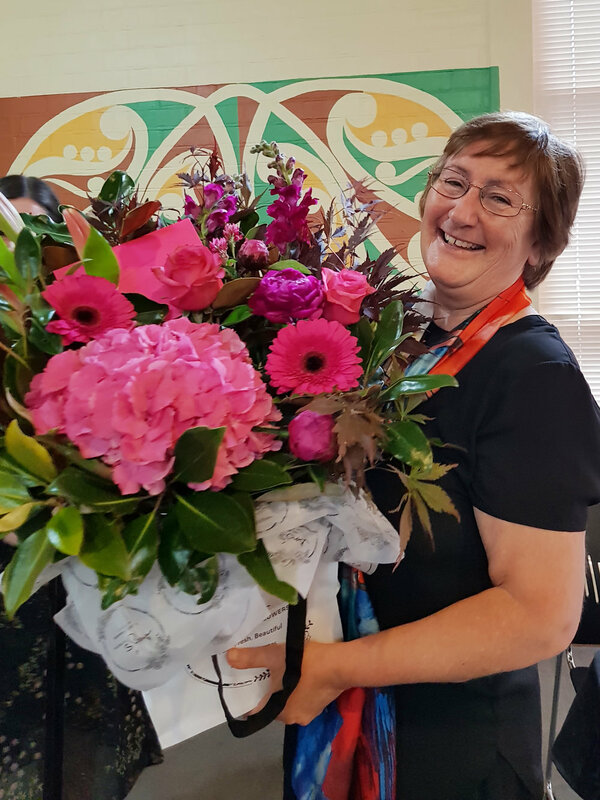 This year two members of our whānau reached their twenty year tenure with the YWCA Aotearoa. I had a chat with Carole, manager of YWCA Whangarei and Anne, manager of YWCA Hamilton, both whom have become well respected and integral members of their local communities, to find out about the highs and lows of their two decades with us. What has been the best thing about working with the Y? Carole: The People- From those I work with, alongside side, meet, network with, support and assist. I spend a great deal of my time/life at the ‘Y’ so that’s important to me. Love the YWCA Purpose. Anne: The ever-changing variety of work and personal contact which comes from being a small part of a national and international YWCA movement making a difference for women and families. What has been (or is) the biggest challenge you have encountered in your journey? Carole: Accessing funding especially for the hostel. We wanted to add more rooms back in 2006 which would have been a huge asset then but even more so now, but funding the project was not possible without funding assistance. There is such a need for accommodation such as the YWCA hostel and emergency housing yet little funding for such an important and necessary aspect of people’s lives. It is an essential basic need. People need a place to sleep, rest and have personal space where they feel safe. Anne: The upkeep of rundown old buildings has been one of my biggest ongoing challenges. What are you the most proud of in your time working with the Y? Carole: The workshops we have run and continue to run for young women to build self-esteem/positive body image. The YWCA Northland ‘Women of Distinction’ awards we held in 2010 to recognise and acknowledge women who had made a commitment and a significant difference in her community and/or the larger world, and whose achievements demonstrated vision, creativity and initiative, our stand against Violence-the White Ribbon and Say No to Violence events we have held and been part of. Anne: Helping to organise the Pacific/Australasia YWCA RTI (Regional Training Institute) held at the now-defunct YWCA of Rotorua. Carole also attended this. Seven countries and the World YWCA President attended this RTI, held at Waiariki campus. Contributing to several young Hamilton/Waikato YWCA women's attendance at quadrennial World YWCA conferences held in locations ranging from Brisbane, Nairobi and Zurich; Pacific RTIs (Fiji); the World AIDS conference (Vienna) and UNCSW, New York. So much has changed in time you’ve been working at the Y and in the women’s movement, especially in the last couple of years with the groundswell of #metoo and the changing political landscape for gender equality. What are you hoping to see in the next few years for the women’s movement? Carole: Personally I would like to see a decrease in family violence and substance abuse. Anne: I'd like to see intergenerational women progressing forward together, expressing a variety of views and opinions. We've all fought and won battles at all stages of our life so far and can learn from and listen to each other's challenges and how to overcome them. If you could give one piece of advice to yourself when you started at the Y, what would it be? Carole: Three things: never assume, your voice matters, you can learn something from everyone. Anne: Quickly learn how to prepare successful funding applications (and how to move on from the declined applications!). Build long-term, authentic relationships. Carole and Anne, we thank you for your wisdom and the amazing work you have contributed in your two decades of service. We’re excited to see what comes next for you both. You can learn more about the work they are doing on over at the Whangarei and Hamilton pages. Want to support the movement? Donate today! DECEMBER IS HERE! And we want you to get in the holiday spirit! Inspired by the Waikato Women's Fund's Suffrage Event in November we are extending our annual food drive to include sanitary items. It’s estimated that hundreds of women are affected by period poverty every year because they simply can’t afford the increasingly high price of sanitary products. 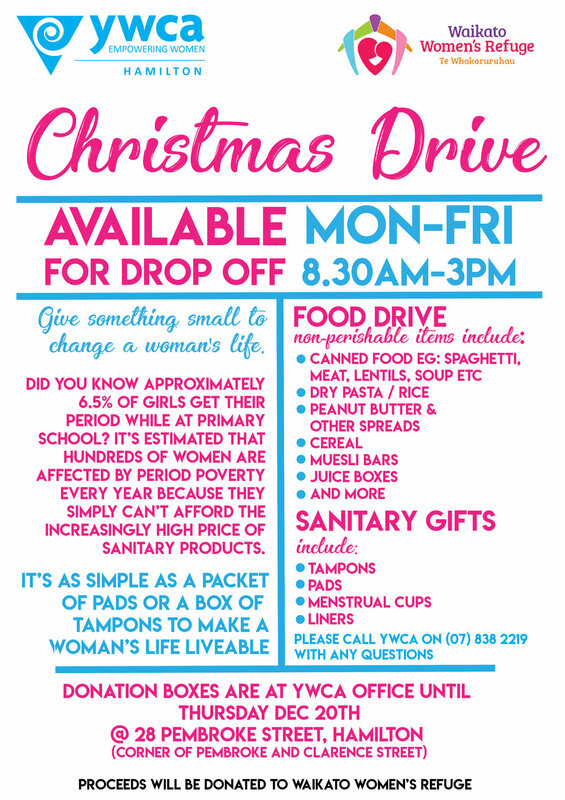 We will be open from 8.30am-3pm every weekday leading up to Thursday Dec 20th, collecting food and sanitary items for Waikato Women's Refuge - please get involved and help out our local women! On the 19th September, YWCA of Hamilton, National Council of Women Hamilton and Zonta threw an event to celebrate a magnificent milestone of 125 years of women’s suffrage. Imagine yourself, 125 years ago, with no voice for anything political. Imagine you are one of more than 30,000 women banding together, writing appeals, signing petitions, doing everything they can to advocate for the women of New Zealand to have a say. 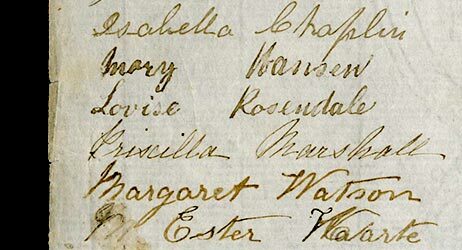 On the 19th September 1893, New Zealand was the first country in the world where women could vote in parliamentary elections. This was a ground-breaking moment, not only for women in NZ, but it inspired suffrage movements for women all over the world. In the lead up to this, there were 32,000 women who signed the largest petition ever to be presented to parliament (270 metres long). The Legislative council, followed a few days later by the Governor, passed and consented the bill and The Electoral Act 1893 was created. This act gave women in New Zealand the right to vote and they would get their first chance at this on 28th November 1893. Suffrage day is an opportunity to not only commemorate, but also further develop the chance to gain equality. We should celebrate suffrage day to not only remember how far we have come as a country, but to continue to find ways to make further progress that benefits our women. Suffrage day reminds us that not only is it important to vote, it is important that women continue voting today and in the future. In the 2011 general election, more than 80% of women voted, compared to approximately 77% of men. Although this statistic is from a couple of elections ago, we can see the shift and affect that women’s suffrage has had over the years. Slowly, but surely, women are making a place for themselves within parliament. Not only are they doing this by being involved in different parties, but also there are more and more women holding some significant positions within the New Zealand parliament. This currently includes Governor-General Dame Patsy Reddy, Deputy Speaker Anne Tolley, Assistant Speaker, Poto Williams, and our third female Prime Minister - Jacinda Ardern. One of the most well-known and influential individuals who was involved with the suffrage movement is Kate Sheppard. She argued, “We are tired of having a “sphere” doled out to us, and of being told that anything outside that sphere is “unwomanly””. Throughout her time fighting for this right for women, she had some brutal opposition. Male writers were recommending women to go home, be with their families, cook meals, and to attend to the domestic affairs for which “nature designed for them”. She co-founded the National Council of Women (NCW) and was the organisation’s first president. Kate Sheppard’s legacy and influence remain greater than ever, and she is still thought of today as being the driving force behind the women’s suffrage movement. In 1991, Kate Sheppard was put onto the NZ $10 note. On the left hand side in the background, we can see a white camellia flower. These flowers were given out to the members of parliament who supported the suffrage bill when it first passed, and now these flowers have become the symbol of the fight for women’s suffrage. On the 19th September 2018, The YWCA of Hamilton, NCW Hamilton Branch and Zonta put on an event to celebrate a magnificent milestone of 125 years of women’s suffrage. This event showed us the continuing support that has been going on for women in our community over the many years. There were three speakers on the day who all talked about how we can support women in our community, and how we need to get more women involved in politics, and why it is important for women to vote. It was great to see so many people attend the event, both men and women, and I hope everyone went home with new information to share. I know I did! The women before us have all worked so hard to get us to where we are today. Let’s continue the fight, and keep showing our communities that our say is important, and does matter. We have come so far in 125 years, and I can’t wait to see what the future has in store for women. You can see more images from the event over at Hamilton YWCA’s Facebook page, or find out more about YWCA Hamilton and the incredible work they do here. This year for the first time, the YWCA of Hamilton is expanding our programmes and workshops to students at the University of Waikato. We will be running one-off workshops once a month at the halls of residence on variety of subjects ranging from practical life skills to self-defence, from healthy cooking on a budget to Money Savvy and mental health. To start this journey we were present at the TGIF Party at the O Week on Friday 23rd February. Our aim was to increase the students’ awareness of who we are and what we do. As a part of this promotion we ran several competitions: two on the day and two online. The (not so) Mini Prize was drawn from among those who gave us their email addresses. Thanks to this competition we now have over 150 emails for UoW female students! The two competitions on Facebook and Instagram are still running. To participate, students need to like our Facebook page or follow our Instagram account and tag someone who has #EMPOWERED them. It was great (and very hot) day at the Village Green! It was awesome to meet so many young women and talk to them about issues we all face as women. We will definitely go back next year and look forward to seeing more of those who will join us this year! If you are based in the Waikato and interested in getting involved, check out the YWCA Hamilton info page.